Periodontal Disease Lansdowne, VA 20176 | Atiyeh Emam, D.D.S. Periodontal Disease is a serious inflammatory condition, caused by a bacterial infection that leads to destruction of the attachment fibers and supporting bone that hold your teeth in place. The infectious bacteria destroy those fibers, causing the gums to separate from the teeth, forming pockets. As the disease progresses, these pockets deepen, causing more gum tissue and bone to be destroyed. Fortunately, periodontal disease can be treated. The first step usually involves a special cleaning, called scaling and root planning. This procedure removes plaque and tartar from the tooth and root surfaces. It helps the gum tissue to heal and pockets to shrink, making it more difficult for plaque to accumulate along the root surfaces. Many adults in the United States have some form of periodontal disease. Bacteria from the mouth combine with mucus and other particles to form plaque. Brushing and flossing minimizes plaque; however, the remaining plaque hardens and becomes tartar. A dental checkup is the only way to remove tartar. 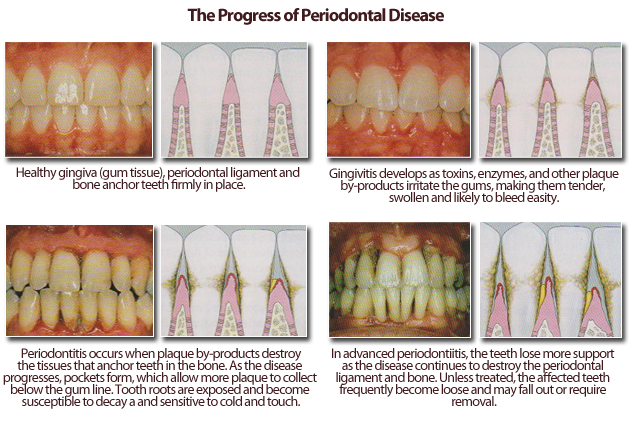 Untreated plaque and tartar can lead to gingivitis, an inflammation of the gums, causing the gums to swell and bleed. While gingivitis can be reversed with brushing, flossing, and regular checkups, it can also lead to periodontitis or an inflammation of the tooth. This is where the gums can pull away from the tooth, form spaces (or pockets), and become infected. Poor oral hygiene is the number one risk factor. Smoking, diabetes and genetics all contribute to periodontal disease. Medications which reduce the amount of saliva in the mouth can also be problematic. We are focused on educating our patients on the prevention and treatment of periodontal disease. We work with all of our patients to emphasize the importance of healthy dental habits and vigilance when it comes to regular hygiene visits. Education is prevention. The staff works with all of our patients to emphasize the importance of healthy dental habits and regular checkups. In many cases, periodontal disease can either be prevented or easily treated in its early stages as long as the patient consistently relies on good dental care habits throughout life.